Home Apparel Merchandising What is Time and Action Plan in Garments Merchandising? 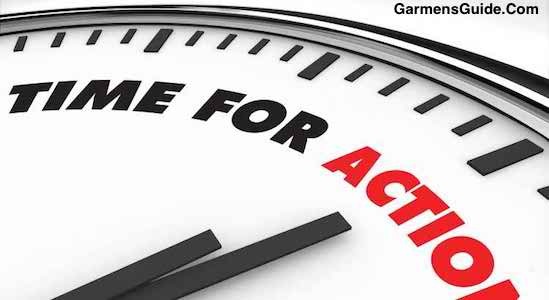 What is Time and Action Plan in Garments Merchandising? Merchandiser make Time and Action plan based on fabrics or accessories sourcing, production, quality assurance and logistics. Preparation of a detailed T&A (Time and Action) plan is very essential in production merchandising. The reason being, large no of activities have to be followed up for each order and a merchandised may be handling large number of such orders and hence it is essential that all activities are listed. This minimises the risk of missing out any of the activities. Hence while preparing a T&A one should list down as many activities as one can think of which are essential in smooth running of the order. A detailed discussion on T&A is done later in this module. This T&A plan is prepared by the merchandiser in consultation with all the concerned departments such as – sourcing (fabrics & accessories), production, and quality assurance, logistics. Once the T&A is finalised the same should be circulated to all concerned departments. Another important aspect of the T&A is fixing the responsibility. Along with finalising the date by which a particular activity has to be completed, the merchandiser should also mention the name of person who is responsible to complete the activity by that time.